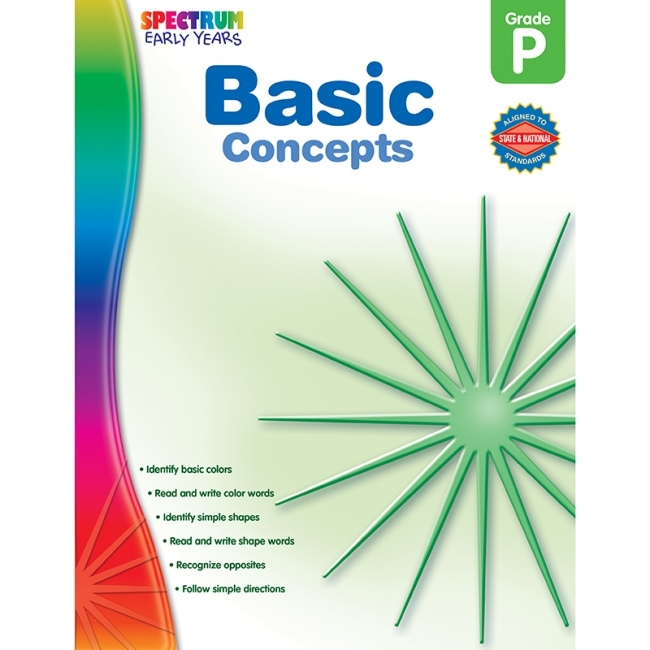 The Spectrum Basic Concepts workbook for preschoolers contains proven instructional methods for developing proficiency. Basic skills include identifying colors and simple shapes, reading and writing color words, as well as recognizing opposites. Each book features 160 full-color pages and a complete set of answer keys. 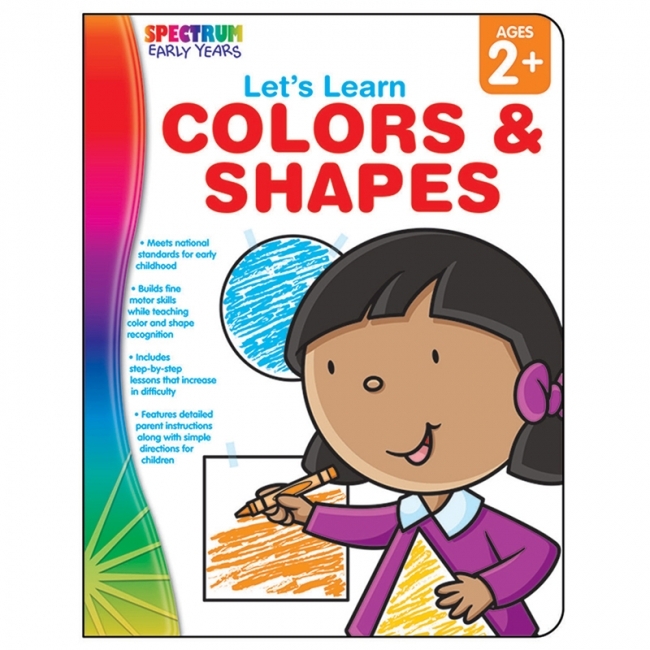 With Spectrum Let's Learn Colors & Shapes toddlers build fine motor skills while learning color and shape recognition. This hands-on workbook offers step-by-step instructions for parents working with children ages 2 and up with engaging activities to delight the youngest learners. Children will enhance their fine motor skills and learn important skills necessary for preschool and kindergarten. 64 full-color pages. 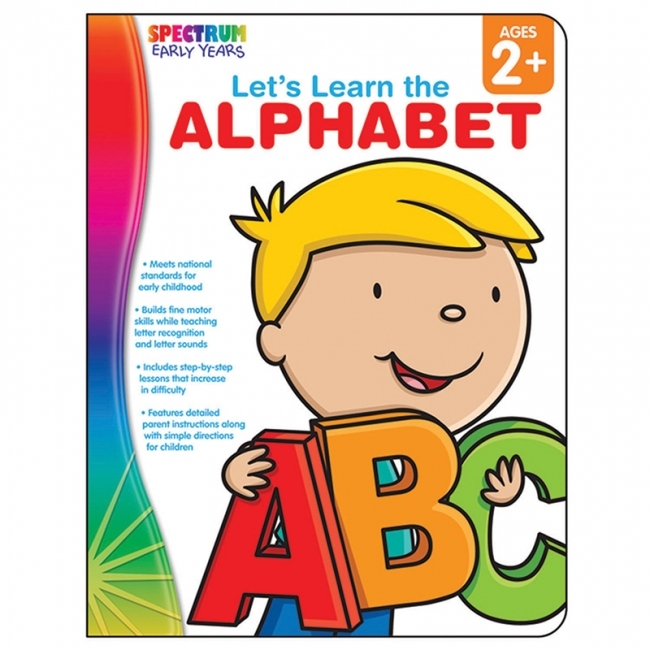 Spectrum Let's Learn the Alphabet builds fine motor skills while teaching letter recognition and letter sounds. 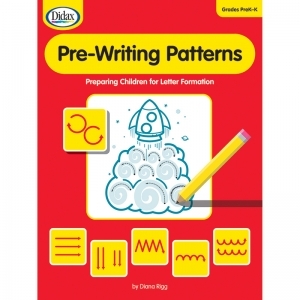 This hands-on workbook offers step-by-step instructions for parents working with children ages 2 and up with engaging activities to delight the youngest learners. Children will enhance their fine motor skills and learn important skills necessary for preschool and kindergarten. 64 full-color pages. 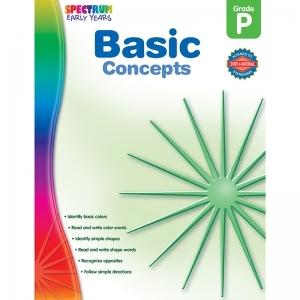 The reproducible activities in this book present a systematic and fun approach to learning the motor skills and coordination needed to form the six basic patterns that compose all letters. 64 pages. Grades PreK—1. 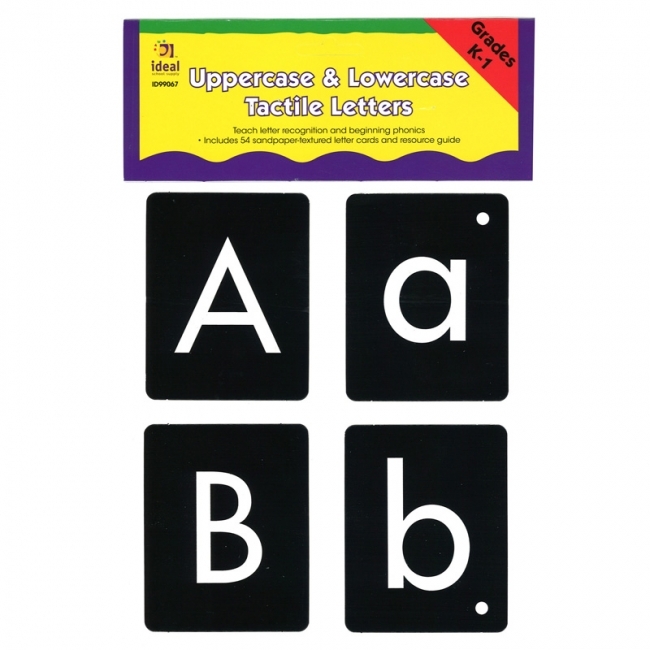 Perfect for students in preschool through first grade, the Tactile Letters Kit includes both sets of lowercase and uppercase sandpaper-textured letter cards, plus an activity guide. 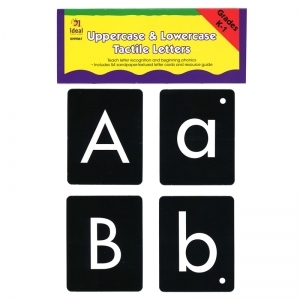 This set is ideal for teaching children letter recognition and basic phonics! Includes 54 pieces. Play with 180 word and photo puzzle pieces and learn how to spell 60 consonant-vowel-consonant words. Improve the basic language and conversation skills of young children or children with special needs with Key Education's CenterSOLUTIONS® Language Skills mini file folder games. The games and learning activities are perfect for centers and learning stations. They will help with targeted remediation, vocabulary development and expansion, conversation building, and social skill improvement. Teachers can customize the activities to target specific learning needs. 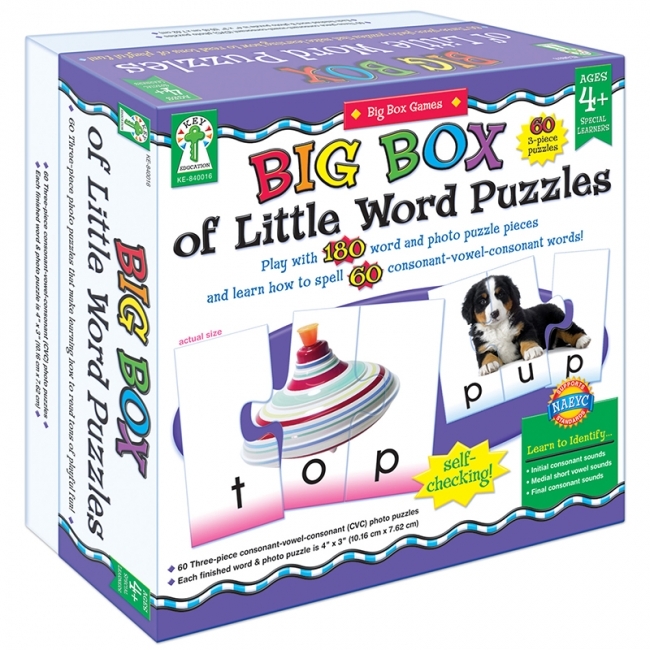 The file folders and game pieces are sturdy, high-interest, colorful, and will provide hours of fun and learning. The colorful, fun, and skill-targeted Mini File Folder Games are the ultimate in making learning fun. 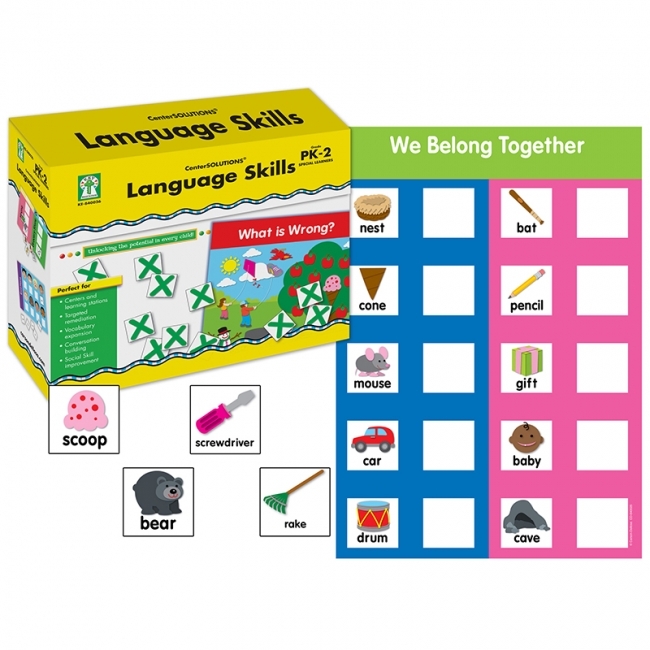 Each sturdy box includes 15 mini file folder games or activities for use with small groups, centers, or independent work time. The games are preprinted--you'll only need to cut and laminate the game pieces! These are a must for all classrooms with young or special-needs learners. 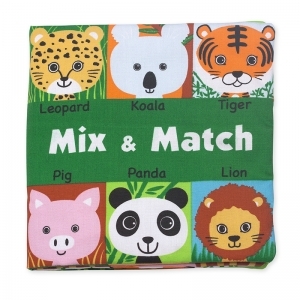 Photographic Matching Cards are the perfect tool to encourage early critical thinking and language skills. 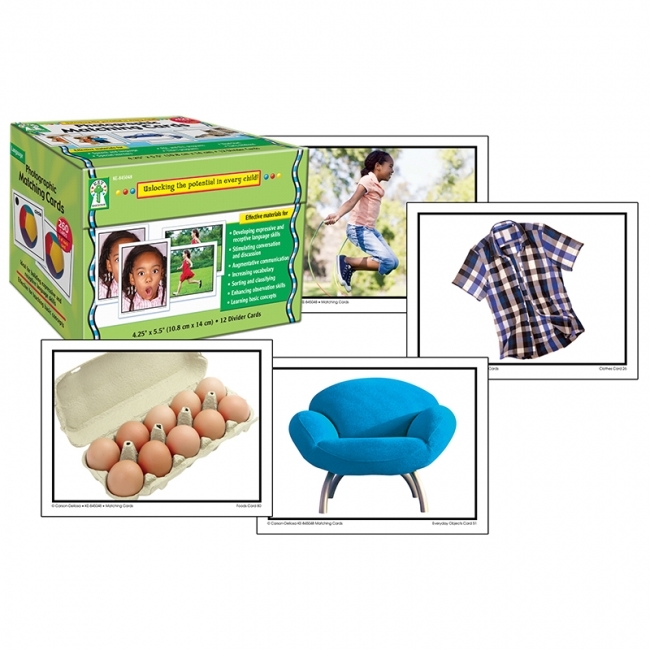 This set of Photographic Matching Cards is a great classroom value for special education, ESL and ELL programs, Title I and Head Start programs. 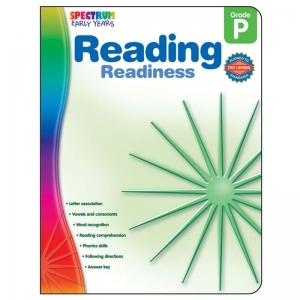 Also a perfect resource for resource rooms, early childhood, and elementary classrooms. Photographic Match Cards are ideal for building expressive and receptive language skills and effective for teaching basic skills. Each of 130 cards has a match, for a total of 260 cards (4.25" x 5.5" each). The cards portray children in a variety of settings, full of real life and childhood enchantment. 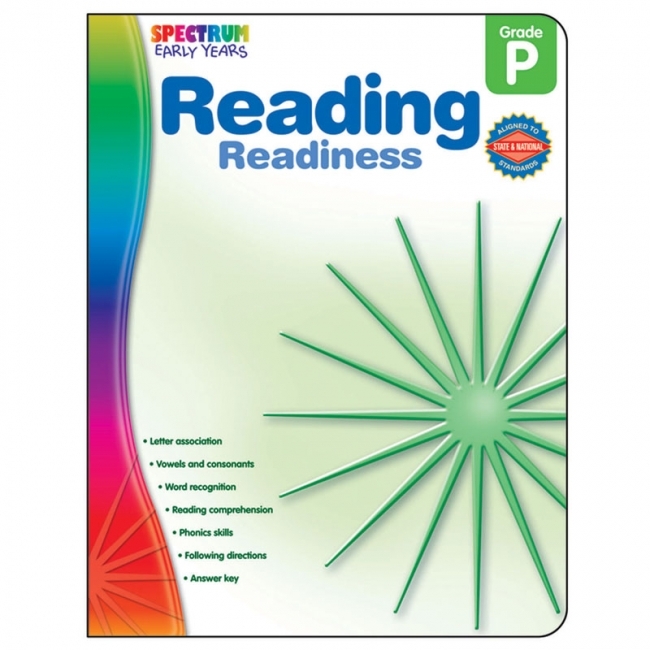 Key Education is an educational publisher of teacher and parent resources designed to build a strong foundation for learning and developmentally-appropriate curriculum for young and special learners. Key Education products are intended to engage and educate young and special learners, as well as assist teachers in building a strong and developmentally appropriate curriculum for these children. The product line - comprised of teacher/parent resource books, photographic learning cards, and other activity- and game-oriented materials - is designed to assist in "Unlocking the Potential in Every Child." 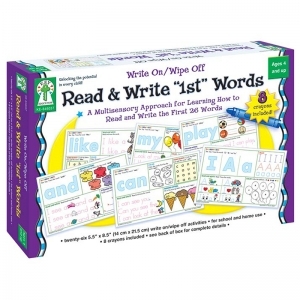 Start young readers with 26 crucial words as they learn to sound out, read, and write these first words. The write-on/wipe-off surface on each activity allows work to be erased and repeated over and over. Each set includes 26 write-on/wipe-off activities and 8 multicolored crayons. 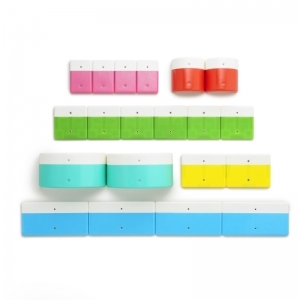 Learn the complex skills of proper cursive handwriting with the sensory reinforcement of magnets. Use the arrows and trace each upper case scripted letter with the magnetic stylus to feel the pull of the magnet. 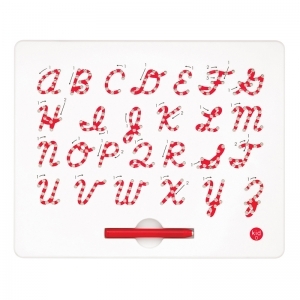 Let the magnetic pen be your quill while learning the art of cursive handwriting. Use the directional arrows and trace each scripted lower case letter with the magnetic stylus for a sensory reinforced lesson. Erases with the tip of a finger. Magnetized blocks of varying sizes snap together to form distinct letters of the upper case alphabet. Use the white borders as your guide to see the individual letters come together. 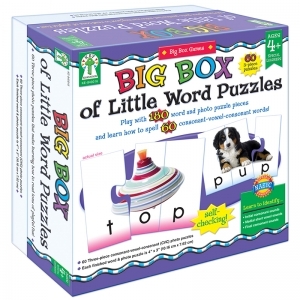 An unrestricted construction toy, use the durable magnetic pieces to build familiar objects or imaginative shapes. Practice problem solving skills to select the correct pieces to match together, while also having the flexibility for open-ended play. Can you find all the animal friends? Turn the crinkly flaps to build a face that matches, or create a silly creature all your own! This crinkling, lift-the-flap, mixed-up-animals cloth book from Melissa & Doug K's Kids is durably constructed to last through story time, playtime, and the washing machine, too! Crocodile can't find his feet! 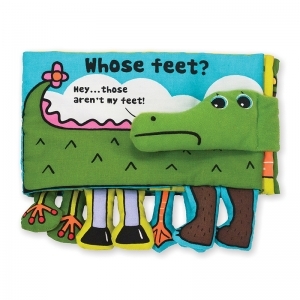 Turn the pages to find out whose feet are down below, and enjoy Crocodile's fancy footwork! 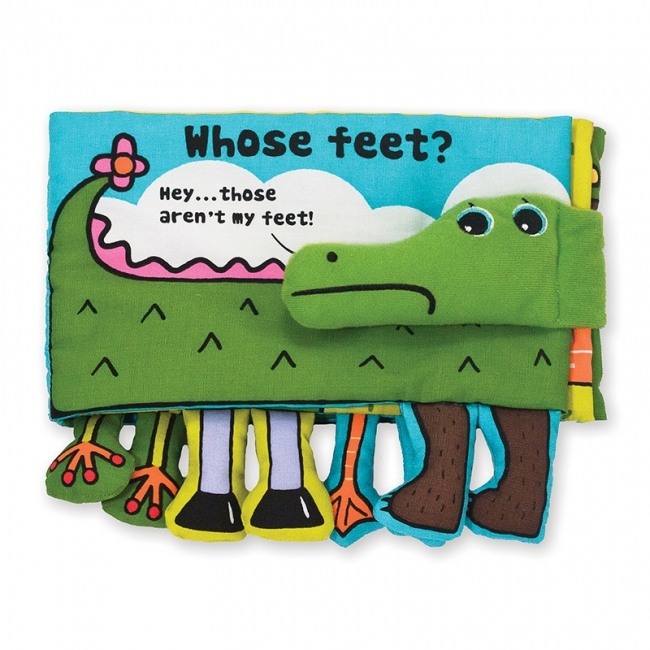 This squeaking, crinkling, foot-filled cloth book from Melissa & Doug K's Kids is durably constructed to last through story time, playtime, and the washing machine, too!